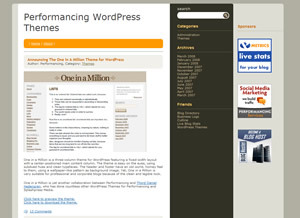 Performancing is pleased to release another great, free WordPress design called the Story Theme. It’s a three column design with the content on the far left, followed by two sidebars. The color scheme uses a subtle mix of tans, oranges and browns to provide great texture and depth for your blog. Rounded corners and a unique left margin give the impression that you have just turned the page in a compelling story. Whether you are writing your blog to tell a story, or engage readers with a product, the Story Theme just may be the perfect choice. You can download the Story Theme here.